I had a dyeing day with my sis and we had so much fun. 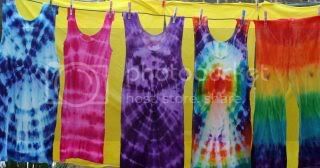 She dyed the singlets - it was her first attempt at dyeing so I think she did brilliantly! I died the pants and didn't do so well.........I dropped a big drip of magenta onto the yellow so you can see two big brown dots! Grrrr!!!! We also dyed some pieces of knit fabric so that we have 3 pieces of every rainbow colour. It was so much fun watching the colours change. I need to work on the red as it came out more like light red and I'd really like crimson, so I'll have to experiment next time. SOunds like a very fun dyeing day! The results are fabulous though! Those singlets are great. Pooh to the drops of magenta on the leggings though - I do things like that too. Don't be too upset - I for one love the pants the best!! !